How does a GSR sensor work? A GSR sensor allows us to measure sweat gland activity, which is related to emotional arousal. To measure GSR, we take advantage of the electrical properties of the skin. Specifically, how the skin resistance varies with sweat gland activity, i.e. the greater sweat gland activity, the more perspiration, and thus, less skin resistance. The most common measure of a GSR signal is not resistance, but conductance. Conductance is the opposite of resistance and is measured in siemens (Conductance = 1 / Resistance). The conductance makes the signal interpretation easier, since the greater the sweat gland activity, the higher the skin conductance. The most common method to measure a GSR signal for emotional research purposes is based on a constant voltage system (exosomatic method). The GSR sensor applies a constant voltage—usually 0.5 V—to the two electrodes that are in contact with the skin. The circuit also contains a very small resistance compared to the skin resistance that is in series with the voltage supplier and the electrodes. 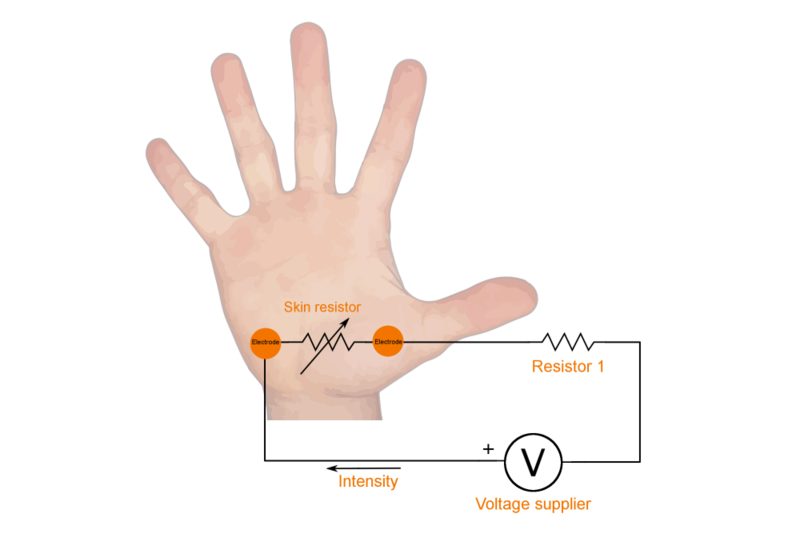 The purpose of this circuit is to measure the skin conductance and its variation by applying Ohm’s law (Voltage = Intensity x Resistance = Intensity/Conductance). As the voltage (V) is kept constant, skin conductance (C) can be calculated by measuring the current (I) flow through the electrodes. With this setup, any fluctuation in the current flow is due to a change in the electrical properties of the skin, and therefore in the sweat gland activity. It is important to highlight that the voltage applied to the electrodes is very small, and the current that can flow through them is very low and not noticeable. The aim of this page is to give a brief introduction to how the sweat glands activity of our body is related to our emotional intensity level.